Join the discussion on our forums! 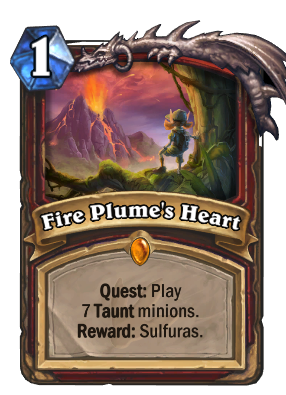 Come discuss Fire Plume's Heart over in our dedicated Fire Plume's Heart discussion topic. Why does an active volcano need to be defended? To save its ash. Taunt warrior was fun, maybe blizz will support it again one day. Rest in pieces. The hero power feels like it should cost more mana or some health. As-is it feels absurd as a guaranteed late-game win just for playing taunts. And it has the terrible effect of making trying to use big minions worse than it already is. With The Caverns Below nerfed, this is the only quest that sees play, how sad. I guess Awaken the Makers will see more play with KotFT because of all the new deathrattles. Breaindead "Quest" for braindead people. Making a typo when insulting people's intelligence? Classic! I played mill rogue vs warrior with this card. He draw cards until fatigue. Didn't overdraw once. At the end didn't even complete the quest, apparently because he put only six taunt minions in deck. People are strange. great idea. 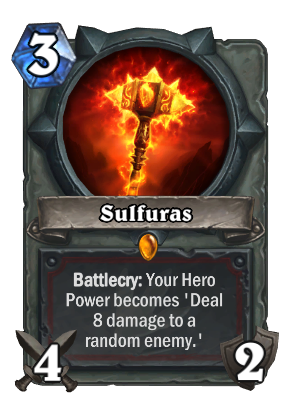 lets just give ragnaros hero power to the best survival class. why was the ragnaros from majordomo was 8 hp then? could have just made it 30 hp. Why is the blood elf kid on this and not on Open the Waygate? Lol I thought the ears were horns ant the pigtails were ears, making me think it was a tauren. Now that I see it closer, you are right. Wow, I love this completely unpredictable win condition! I love having every single long control matchup end with a 50/50 ragnaros blast!!!! Randomness is sooooo fun!!!! Thanks Blizzard!! Making control decks great again!!!!! Try it, then. The lack of reliable removal and minions with large attack values makes board control very difficult lategame. (Although, admittedly, effortless early game.) In the late game, it requires a lot of prediction and smart value management to even use the DIE, INSECT effectively. Absolutely, I've beaten multiple control priests using this quest. I find it useful to limit card draw, so you always win the fatigue war. Grimy Gadgeteer can go great with this if used carefully. I crafted this card on day one and tested it extensively, it works, it can be done. There's a lot of room to build your own deck like you want so I guess the card is pretty resilient to meta changes. I also beat a few of those "tier 0" quest rogue, once even if I burned one brawl due to opponent playing coldlight oracle so it must be a good card, it's not super strong, I don't see this card being popular like aggro in gadgetzan if the devs don't print broken taunts and it's better this way.